I generally pay attention to experts. The advice of those “in the know” has often saved me from mistakes and injury. There’s one area, though, where I believe the experts are wrong – in how to clean up your running shoes. 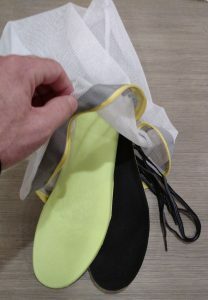 Athletic shoe manufacturers almost universally advise that their products don’t need to be cleaned, or if they must be, that spraying a garden hose, or a brief soak in the kitchen sink is all that is required. In the shared wisdom of these experts, laundering shoes is a Cardinal sin, resulting in the premature and painful death of a beloved set of kicks, and the probable damnation of the offender. Over their normal lives, a pair of running shoes will be subject to over 500,000 impacts, each equal to several times the body weight of their owner. They’ll be drenched in perspiration from within and, among those that leave the confines of a treadmill, soaked in precipitation and puddles from without. Each one of those half-million foot strikes will raise dirt that will settle back on the shoes and their wearer. Much of this dust, sand, and the salt crystals left by evaporated sweat, has sharp edges and can cause excessive wear of the shoe material. The sweat and moisture provide a good environment for the growth of bacteria and permafunk. If all of that is the natural environment of footwear, then an hour spent tumbling in cold soapy water with some towels seems downright benign! Afterwards, stripped of their sharp-edged and corrosive contaminants, the shoe fabric can breathe. 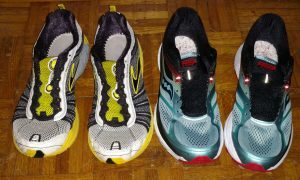 A few grams in weight reduction can provide a speed boost, and you can show your face in social runs again, freed from the burden of shoe stank, with sparkling footwear that no longer looks like a hand-me-down from Pigpen. With those benefits in mind, I confess that I put my shoes in the washing machine. 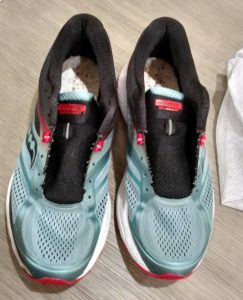 I don’t do so often – generally once, halfway through the running life of the shoes, and again when I retire the shoes from running and either demote them to casual wear or donate them to some worthy charity. I also have the benefit of a front-loading washer without an agitator. If I had a conventional top-loading washer, I’m less certain that we would be having this conversation. Finally, because the world is now run by lawyers, I need to stress that while this advice has worked for me dozens of times, that in using this information, the risks to you, your shoes, laundry equipment and destruction of your home and neighborhood are entirely your own. 1) These instructions apply ONLY to running shoes constructed with conventional man-made fabric. If your shoes have leather, suede, nu-buck, or other special materials, check with the manufacturer for care instructions. 2) Remove shoelaces and inserts or sock liners before washing. These items may be laundered separately in a lingerie bag. Pay attention to the lacing pattern so you can duplicate it when you reassemble your shoes once they are clean. Remove any electronic components, if present. 3) If you have any large chunks of dirt or rocks embedded in the tread, remove what you can BEFORE laundering. 4) Use a front loading washing machine. If your washer is a top-load, or if your laundromat front-loader lacks a gentle or delicate setting, then all bets are off. If this is you, stick with the manufacturer’s recommended hand-washing in your kitchen sink. 5) Do not use harsh detergents or chlorine bleach. Regular HE laundry detergent is fine; an ounce of the sport-specific detergent seems to be better at de-funking, and a half-scoop of OxiClean is a useful addition to banish grass and other stains. Do NOT use fabric softener. 6) Add a towel or three to provide additional cushion and a scrubbing surface in the wash cycle. The larger the towel, the fewer you need. I generally put in two medium sized bath towels with each load. 7) Use a delicate setting and cold water. 8) I usually add an additional rinse cycle to make sure all trace of detergent is gone. 9) Air dry your shoes when they come out of the washer. DON’T EVEN THINK ABOUT PUTTING SHOES IN A DRYER! I live in a rather humid part of the world and, even in air conditioned space, it takes at least 24 hours before the shoes are dry enough for me to put them back together. 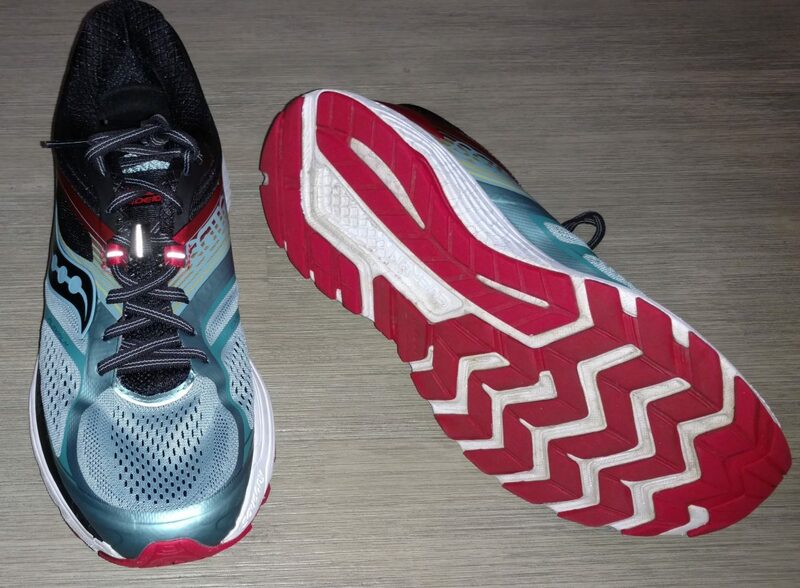 10) Re-assemble your shoes (restoring laces and sock liners) only after they are completely dry.